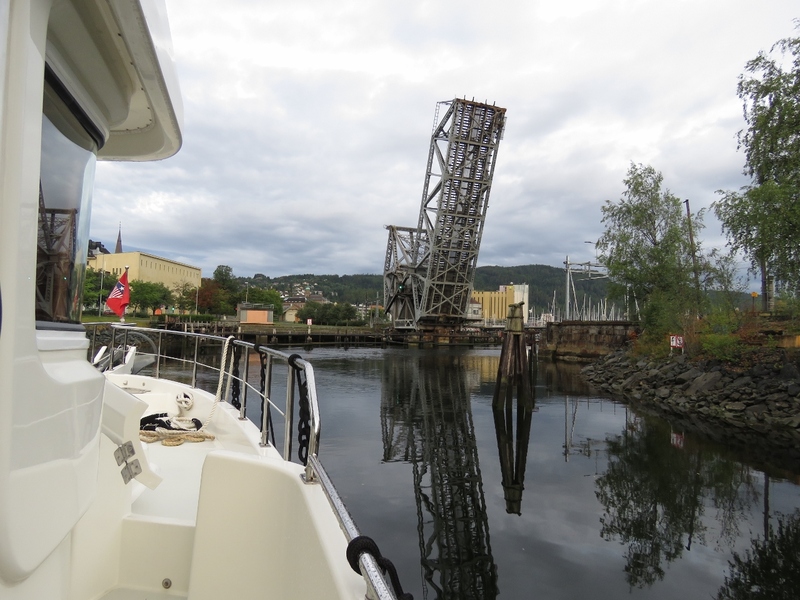 After five weeks in Trondheim, we departed for Norwegian destinations farther south. We really enjoyed our stay, and it was an excellent place to leave the boat while we returned to Seattle for work. From Trondheim we travelled 140 miles south and anchored for a few days in Vagsetervagen while a storm system passed through. En route we saw a variety of ships, the most memorable being the 60-knot surface-effect craft Glimt. Departing our berth in Vestre Kanalhavn in Trondheim. We passed through Skansen Bridge on the first opening, just after 6am. 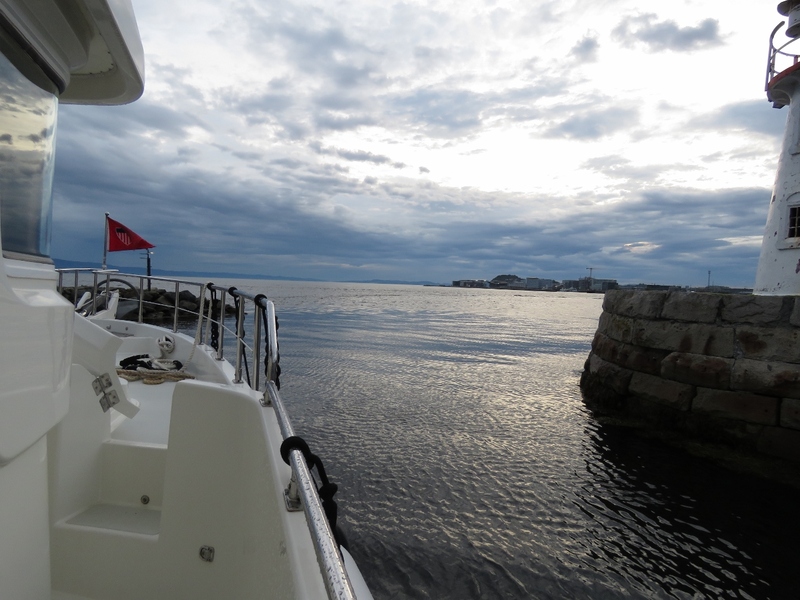 Rather than continue behind the breakwater alongside the marina, we exited earlier through a narrow but sufficiently deep small boat passage. 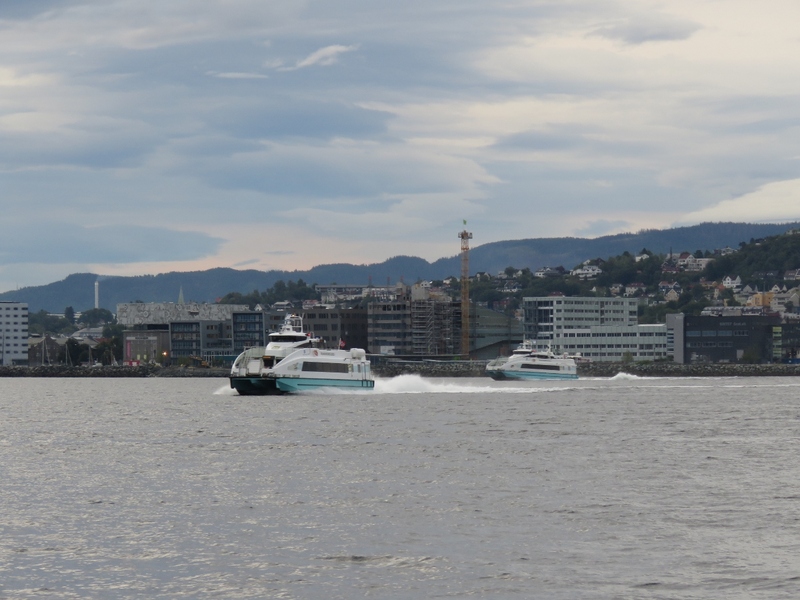 Two fast catamarans departing Trondheim, likely the start of their workday. The row of fenders we had deployed against the pilings in Trondheim. It will take a while to get everything stowed. 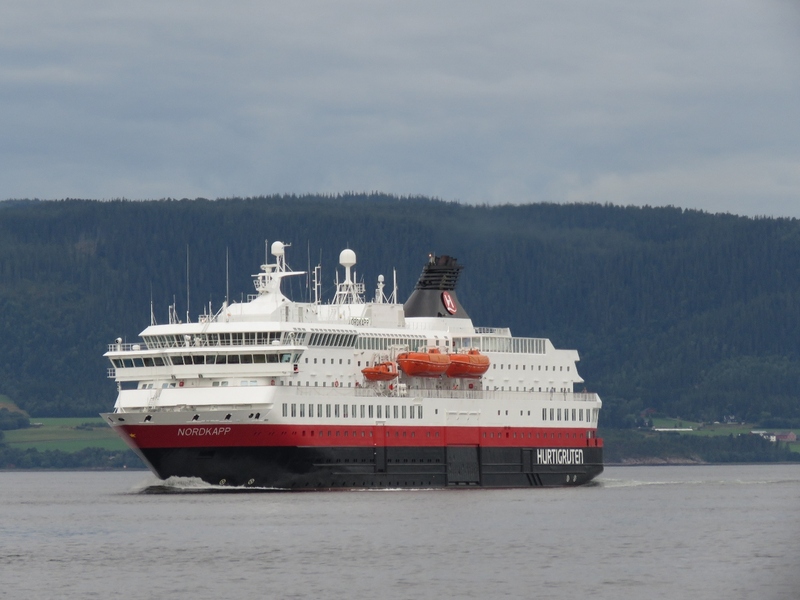 The Hurtigruten Nordkapp en route to Trondheim for an 8:30am arrival. 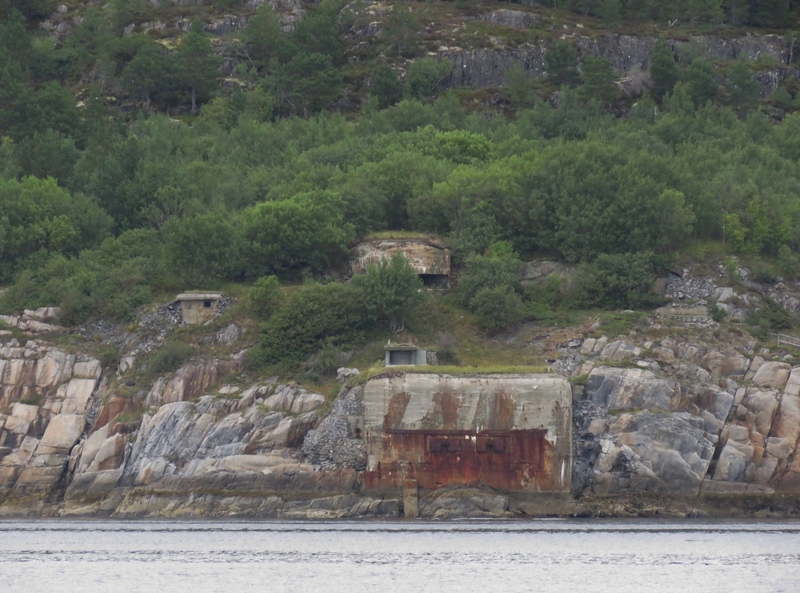 German World War II fortifications to our east. 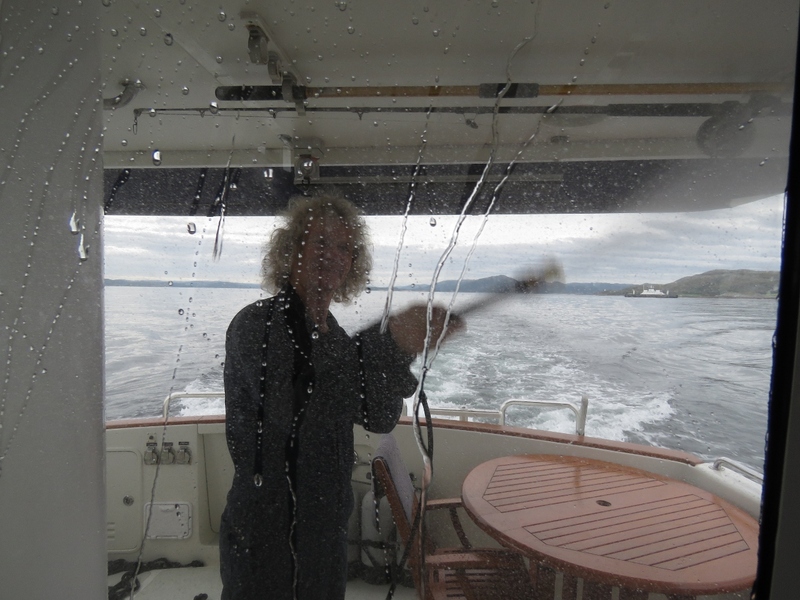 James giving the boat a power washing. It had gotten a little dirty after several weeks in the city. 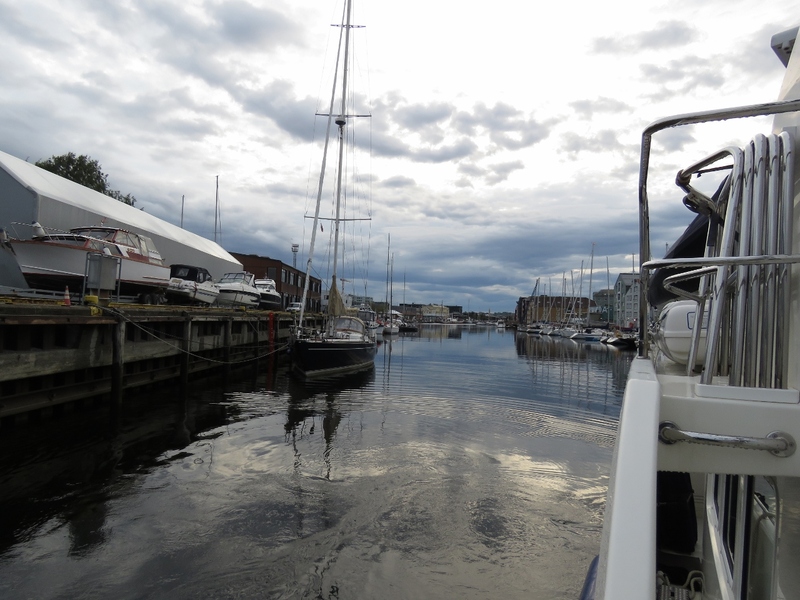 The long lines we’d deployed in Trondheim spent a fair bit of time in the water at higher tides and were quite dirty. So we power-washed them clean and hung them up to dry. 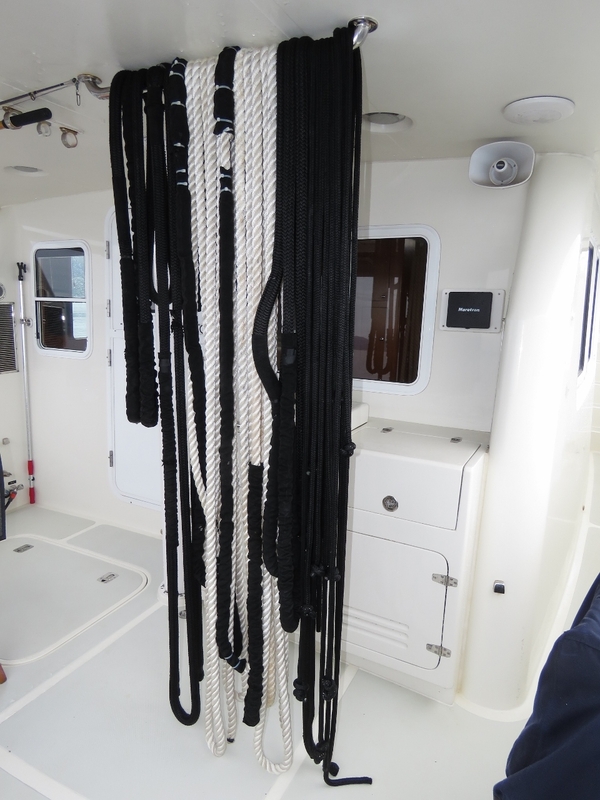 Pictured are 2 white 1-inch 75-foot lines, two black 1-inch 25-ft lines that we’d tied together to make a 50-foot line, a black 1-inch 35-ft line, and a dozen or so lightweight lines used to hang the fenders. 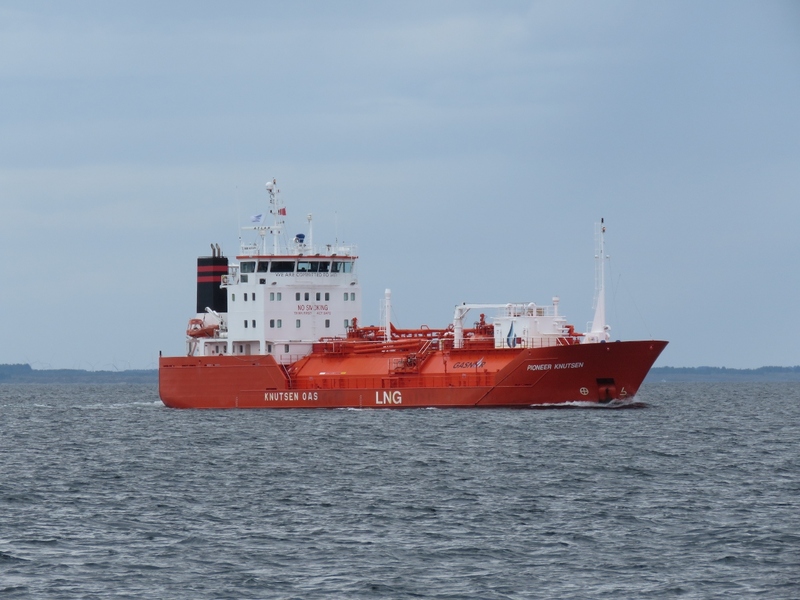 The Danish tanker Tern Sea en route to Trondheim. 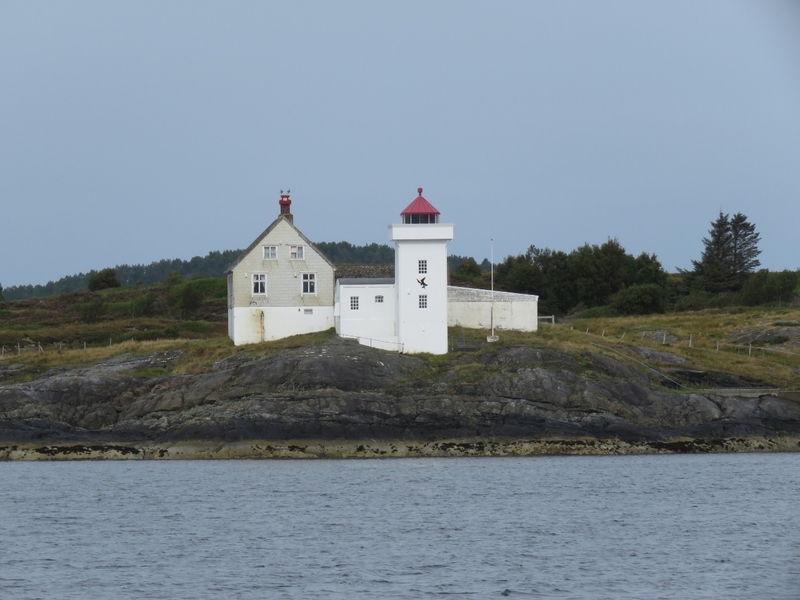 The lighthouse on the island of Terningen was built in 1833. It was automated in 1991 and the buildings now serve as a guest house. 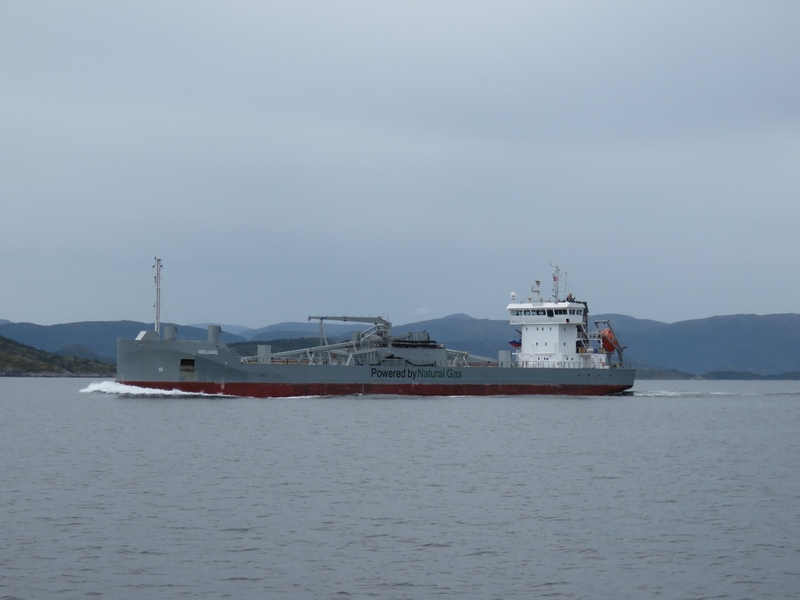 The Dutch natural gas-powered cement carrier Ireland heading to Trondheim. 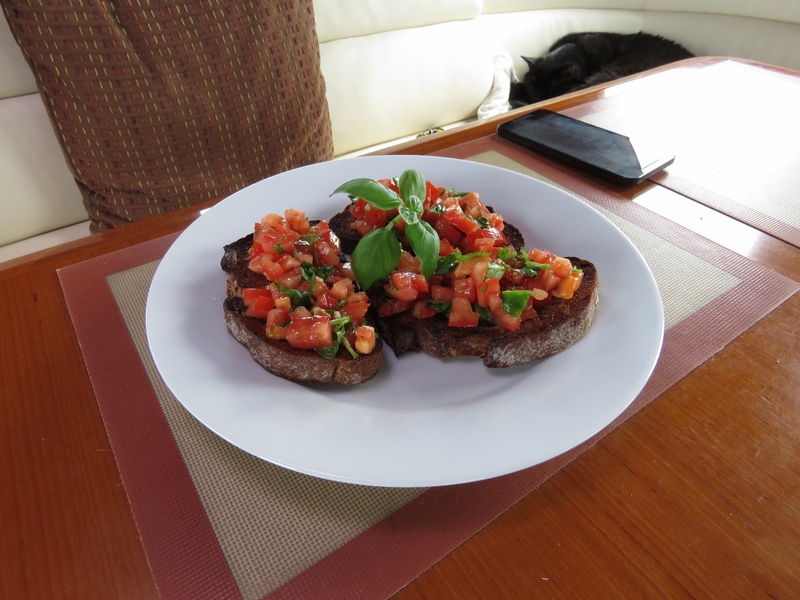 Bruschetta for lunch underway with delicious dark bread and fresh tomatoes and basil that we’d picked up at Meny in Trondheim. We’ve been particularly enjoying the whole-grain breads in Norway. 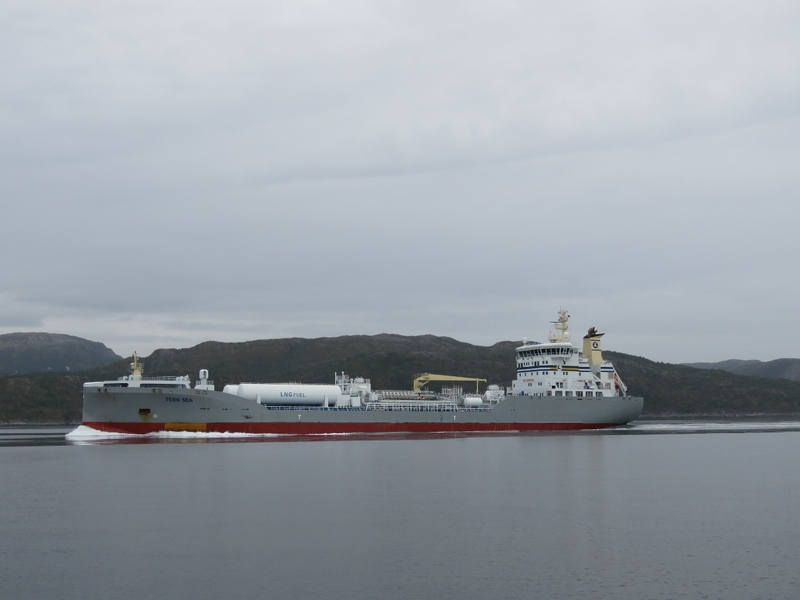 The LNG tanker Pioneer Knutsen, also en route to Trondheim. 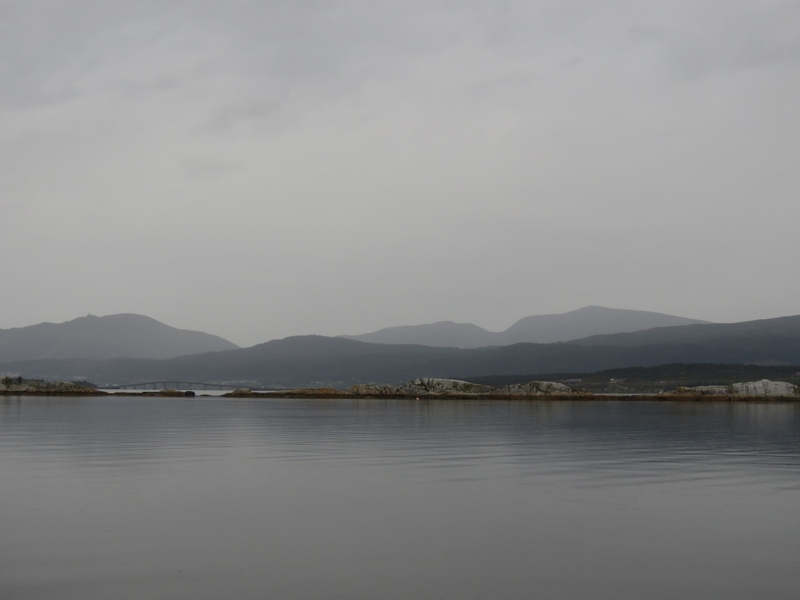 A ferry was exiting through the channel at the north end of Ramsoysundet as we neared our intended anchorage there, and we were looking forward to seeing one pass while we were at anchor. When we heard a roar, we expected to see a ferry and instead saw the Royal Norwegian Navy Skjold-class corvette Glimt passing through (Skjold means ‘shield’ in Norwegian and Glimt means ‘flash’). 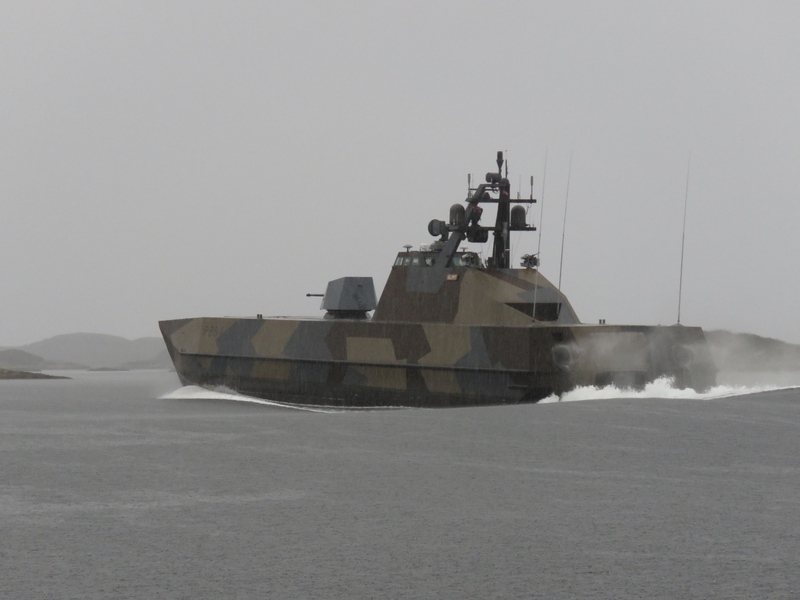 The Norwegian-designed Skjold-class ships are surface-effect crafts made of fiberglass and carbon composite materials. The 155.8 ft (47.50 m) vessels displace only 275 tonnes fully loaded and can travel at over 60 knots in calm seas (the top speed is classified). It was probably doing close to that as it passed through the anchorage, throwing a stupendous wake. But we loved seeing it. 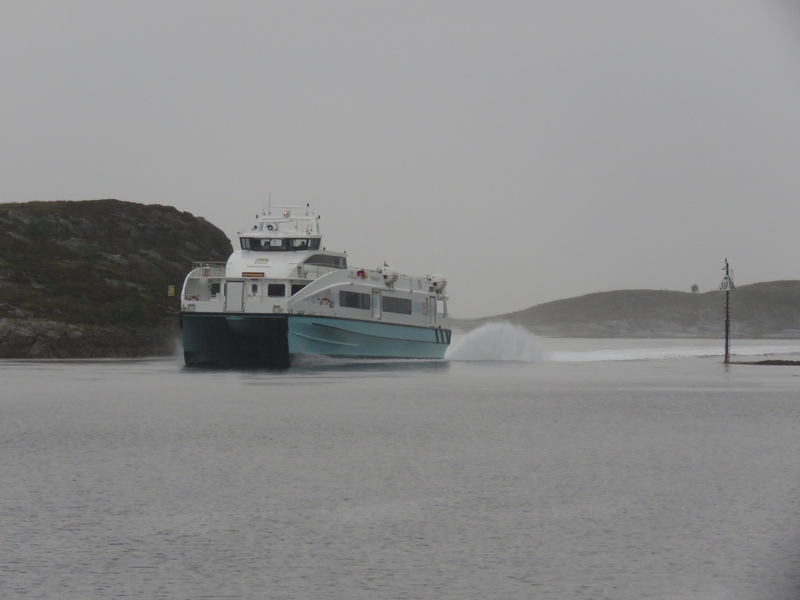 We also did get to see a ferry as the Terningen passed through after the Glimt. But that was the end of our excitement for the day. 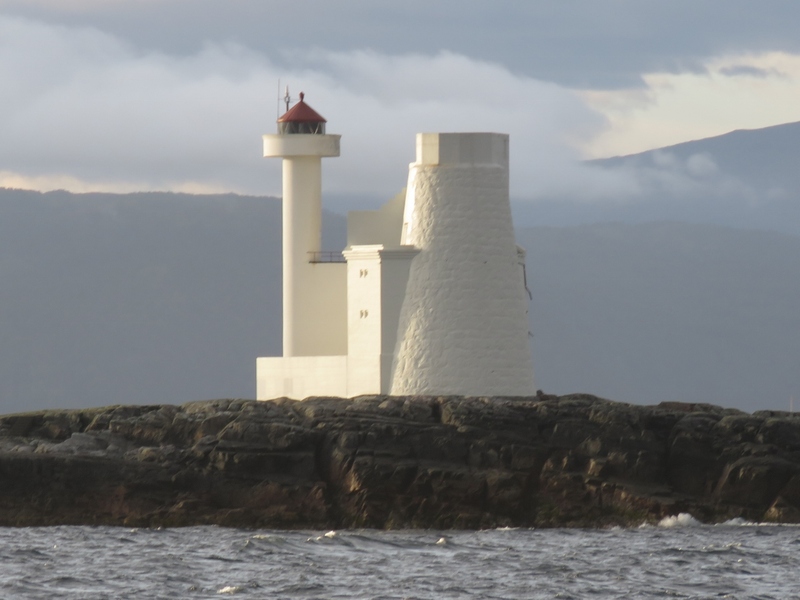 Hestskjaeret lighthouse, constructed in 1879, aglow in the morning sun. The massive Nyhamna Gas Plant, completed in 2007. 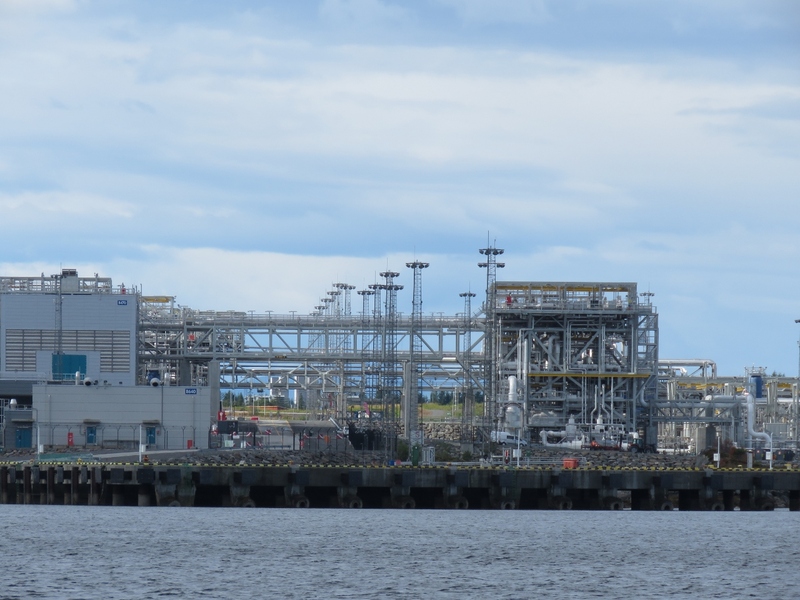 The plant sends gas through a 745-mile undersea pipeline across the North Sea to Yorkshire, England and supplies 20% of the UK’s gas requirements. 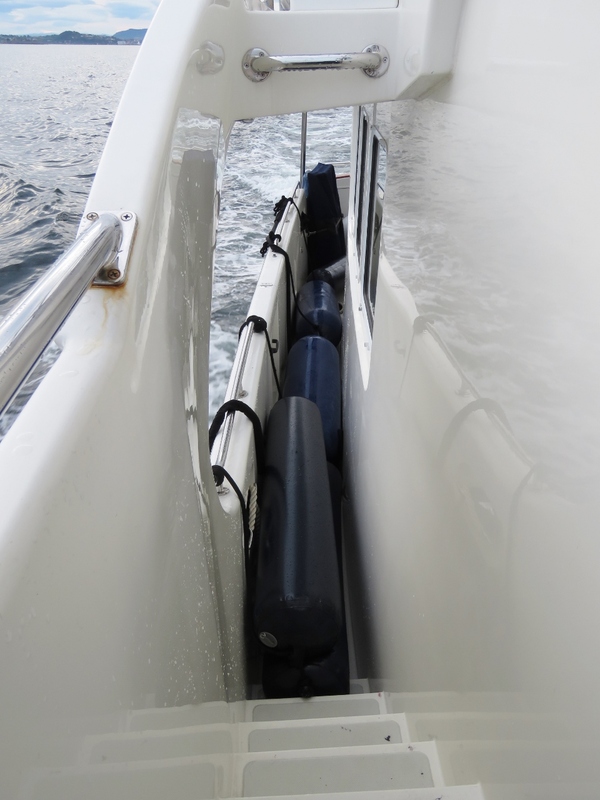 We had 30lb Nauticus trim tab actuators on the previous tender, and installed our spares on the new tender. But we felt the newer tender could use beefier actuators, so we brought some 40lb ones back from Seattle and installed them today. The view north from our anchorage at Vagsetervagen. We’ve stopped here for a few nights while a weather system passes through before continuing on to Andalsnes. Our emergency hydraulic pump won’t run unless it is primed. 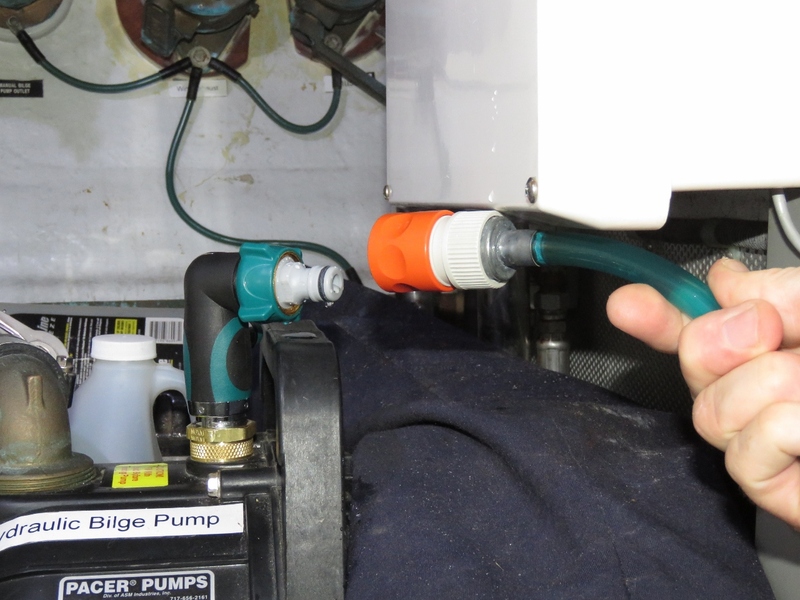 We’ve been keeping RV anti-freeze in it since that won’t evaporate and it ensures the pump will be primed and ready to go. The problem with this approach is if you make a mistake when operating it and accidentlly run it dry, it will take some time to get the plug out, get water, and refill the pump to restore the prime. 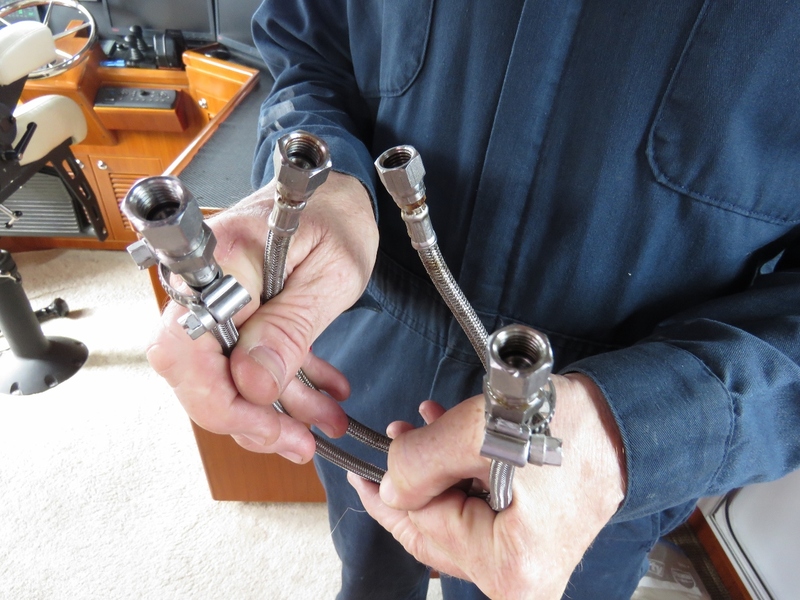 Josh Tofield of Nordhavn 52 Samba came up with the good idea of putting a valve and a hose quick-disconnect on the pump fill port. In this model we just snap on the hose, turn the valve to prime the pump, close the valve, and the pump is ready to go. 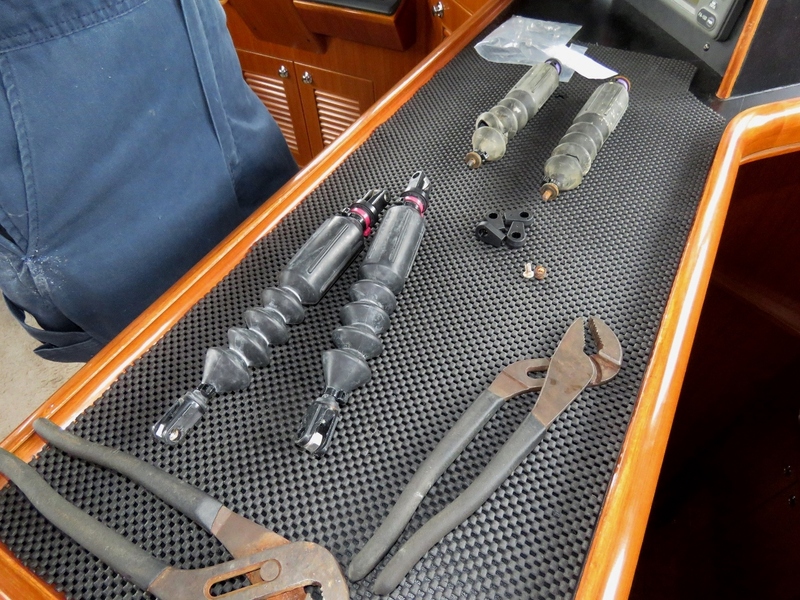 While in Seattle, we had MFCP make us some hydraulic hoses to replace the crane hoses that failed while we were in the Lofotens. James installed them today. These are the old hoses, one of which is held together by small hose clamps. Remarkably, it worked beautifully and didn’t leak. The storm system we expected is passing through today, bringing gusty winds into our protected anchorage. The offshore winds are forecast to approach 50 knots. Jennifer often comes up from the freezer down below having “caught” some excellent Salmon. That’s our kind of fishin’ :-). Glimpt translates to Flash in Norwegian; and I can see why, as she looks to have a very faceted appearance and uber stealthy build. Your photo is the first time I’ve ever seen one. It looks like a catamaran hull that rides on an air cushion. I bet its got terrific shock resistance from wave impact and capable of operating in some fairly shallow waters, too! I live in a naval shipbuilding town, but I’ve never seen anything like this. Just imagine travelling at roughly 70 mph in a vessel like this! PS: Do you ever use those fishing rods to catch tea for the Master & Commander? Yes, totally. It’s an amazing boat. We were anchored in a fairly narrow bay with quite narrow passages to enter and exit and he went through at cruise speed with the turbines screaming. It was absolutely amazing. The wake was pretty astounding as well running around 4’but we don’t care. It was very cool to see the boat up close at speed and it was impressive watching them bring it through narrow channels as fast as they did. It’s fun to watch it underway and we would love to see it on the inside. Haven’t fished for years. We got serious about it around 2013, worked at it a bit while underway and kept loosing lures to fish bigger than we were rigged for even though we were using some very heavy leaders. Eventually just lost interest due to insufficient success and perhaps not enough patience to fish.